WELCOME TO MY MONEY MISSION ONLINE: HAVE A BLESSED SUNDAY! 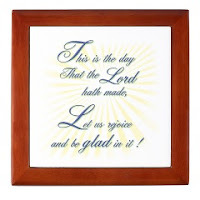 "This is the day the Lord hath made; he calls the hours his own. Let heaven rejoice, let earth be glad, and praise surround the throne........"
Thanks for stopping by my blog! As to your question regarding recipes, as you could tell I haven't done much lately. But this is the summer of cake! so I'll be posting pics and cake recipes here and there throughout the summer. You have a lovely blog and I like your ideas about making a dollar go further! Kudos!! !